The exterior of Big Smoke's Crack Palace being guarded by two Ballas gangsters shooting at Carl Johnson during End of the Line. Big Smoke's Crack Palace is the home of Grand Theft Auto: San Andreas character Big Smoke and is used as a crack palace by the Ballas, Los Santos Vagos and the Russian Mafia, and as a front to sell drugs around the city, mostly crack cocaine, hence the name, while their enemies, the Grove Street Families are disbanded, Ganton is owned by the Ballas, Carl taken away by Frank Tenpenny and Eddie Pulaski and Sweet is imprisoned. The power of Big Smoke increases with the drug trade from the Crack Palace to all over Los Santos. The building is located in East Los Santos, Los Santos. Big Smoke moves into the building sometime after Carl Johnson is forced to leave Los Santos. The other front of Big Smoke's drug empire, second to the Crack Palace, is the yay factory in Doherty, San Fierro, destroyed by Carl Johnson in the mission Yay Ka-Boom-Boom. In the mission End of the Line, Carl Johnson enters the building and kills Big Smoke, before Frank Tenpenny destroys part of the building. The building can be accessed after the mission End of the Line. There are also Sprunk vending machines inside the crack palace. The statue that is in the picture, is how Big Smoke was actually going to be depicted as seen in the first trailer of San Andreas. On the PlayStation 2, the entrance to Big Smoke's Crack Palace can be blown off with any sort of high level explosive (Rocket Launcher's and Remote Grenades for example, regular Grenades and car explosions do not work) before End of the Line, which reveals Blue Hell. However, this was fixed when the game came out on the PC. When shooting the statue of Big Smoke, as seen in the picture, the sparks that come out look a bit like blood. Whereas Tenpenny destroyed the machinery in the drug lab during the events of End of the Line, it cannot be destroyed in normal gameplay. After the mission King In Exile, Cesar calls CJ and informs him that Big Smoke expands his business to San Fierro by sending a courier from the Crack Palace to deliver drugs there. If CJ responds positively, a mission starts and CJ has to kill the courier on his way to San Fierro. That depicts that Big Smoke had decided to move to the Crack Palace before The Green Sabre, because King In Exile is made in a very short time after The Green Sabre. That can be explained, because in The Introduction, in a conversation between Mike Toreno and T-Bone Mendez, Toreno says that he found "a buyer" from Los Santos, meaning that Big Smoke had ties to the Loco Syndicate before the game even started. 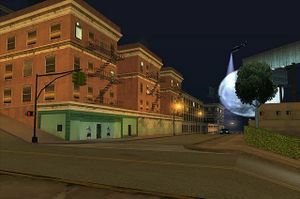 The crack palace is made up of four floors, the "Security Area", the "Drug Lab", the "Ballas Lounge" and Big Smoke's suite, as depicted in the mission "End of the Line". The damaged exterior of Big Smoke's Crack Palace following the mission End of the Line. The foyer area on the ground floor. A large room containing wooden crates on the first floor. The drug laboratory on the second floor. An office on the second floor. A room with a bar on the third floor. A statue of Big Smoke on the third floor. The main room of the building on the top floor. The television/security area on the top floor. This page was last modified on 12 August 2012, at 20:19.